Of all the places of Hindu worship in the Amparai District, the sylvan shrine of Ukanthamalai Murugan Kovil devoted to the Lord of Kataragama, nesting in the womb of thick jungle and rocks, is a manifestation of Divine Power and sublimity and stands unique as a popular pilgrims’ resort, much hallowed as a centre of penance and prayer. Pilgrims from all parts of the country, despite their varied religious faiths and cultures throng to this sacred rock Temple with adorations for spiritual salvation. Nearly 30,000 pilgrims attend during the last few days of its annual festival in July. Pilgrims arriving at this shrine seem to believe that a prayer at this shrine brings them good luck and divine intercession in times of difficulties. Consequently, pilgrims visit this shrine at all times of the year. Pujas are not confined to any one time but at any time by the ever flowing stream of devotees. The Sri Lanka Transport Board operate a bus service for the benefit of those pilgrims to Ukanthamalai Rock Temple. The famous shrine at Ukanthamalai Rock is situated (approximately twelve miles south of Panama on the Kumuna-Panama jungle path. There are seven rocks held very sacred. The old and the young, the sick and the weak are seen climbing the rocks to offer pujas. Devotees carrying offerings of coconut, camphor, joss-sticks, plantains, betel-leaves and, areconuts and such other essentials pray for deliverance, or success, for health and material gain as well. Although several festivals are conducted during the seasons of the year, the Esala Festival draws the largest crowd. The festival begins with the hoisting of the Mayoora flag according to vedic rites by a Brahmin. Pujas and peraharas are conducted during the days and the nights for 15 days. The festival ends with the ceremony called “Teertham”, or, “Diya-Kepima” on the full moon day. 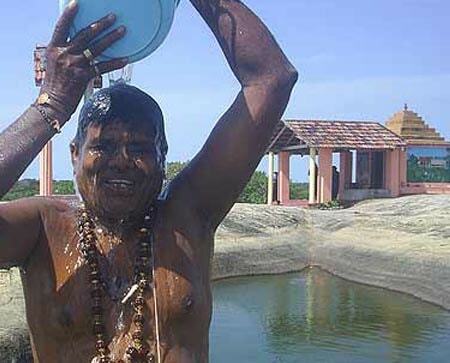 Ukanta Malai is famous for its 32 teerthams, natural cisterns in the rock where Valli Amma Herself bathes and where devotees too come to pour a bit from each teertham upon each other. Below: Pada Yatra pilgrims circumambulate Valli Amman Kovil upon the top of Ukantha Malai. It is held that any one bathing in the rock pond called “Brahma-Theertham” on this day, the “Panguni-Uttiram” gets cured of ailments of the body. The devotees who fast during “Skanda-Sasti” in October gain spiritual power. The “Vaikasi Visakam” which coincide with Vesak is yet another popular festival of lights like the “Tiru Karttika”. 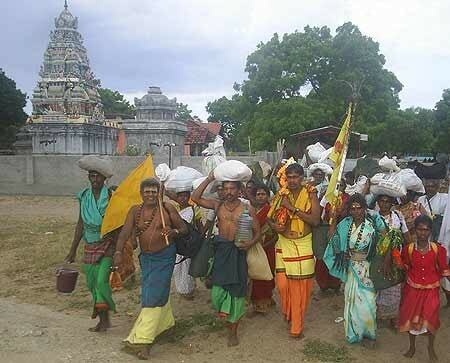 Devotees from all part of the country visit this shrine for all these and the pilgrims are afforded shelter and food in the Pilgrims’ Rest donated by the Karaitivu Saiva Sabha. 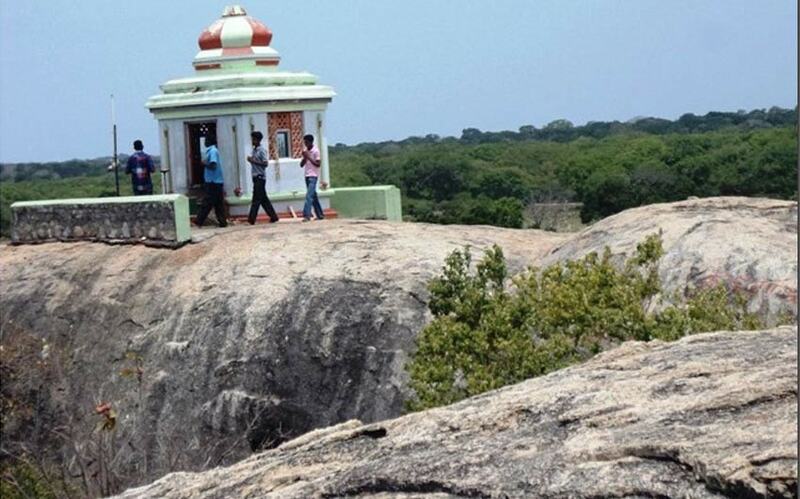 The number of devotees arriving at Ukantha Malai Rock Shrine indicates that worship at this jungle shrine is efficacious--that is, devotees here obtain their desired boons. Pilgrims wending their way through the jungle to Kataragama on foot spend a number of days engaging themselves in prayers and observing penances here. The many spreading trees and the hills, the golden sea beach and the reclusive rock caves offer the seeker of bliss all opportunities to meditate without interference. Kavadi dance is a special feature in this shrine. Persons who have taken vows travel on foot to this shrine accompanied by a choir of singers of devotional songs, carrying a gaily decorated kavadi with bunches of peacock feathers. Some of the kavadi dancers mortify their flesh with sharp silver arrow-headed pins piercing across their cheeks or tongues while dancing to the tune of tom-tom beatings and the nadaswaram music. They dance under an ecstasy amidst the cries of “Hara-Hara”. There are the other devotees who, with gagged mouths carry pots of burning camphor on heads. These devotees go round the shrine and the hills in fulfillment of a vow already taken. There are the other devotees who roll on the hot sand. It is explained that these are done for reparation of sins committed on this earth. Worshipers have realized that the sacred hills that surround the Ukanthamalai Rock Shrine are home to ascetics in their astral bodies. Their presence is experienced by pilgrim when they are protected from dangers. These ascetics guide the devout pilgrims in every way. Persons who lost their way had been saved. Pilgrims had been saved from dangerous wild animals. Desires are fulfilled and prayers are granted; vision of the Lord is obtained. It is held that the Lord created the rock ponds on the hills to purify the devotees who perform the prescribed fastings in the shrine. The atmosphere at the shrine is very condusive to purify ones mind. For all those who worship Lord Murugan at Ukanthamalai, the Lord is a living manifestation of Divinity. Through His benign grace, worshipers are rescued and emancipated. The Lord is loved, identified, idolized and reveled in their prayers.